RSAF’s Chief of Staff (Air Staff) Brigadier-General (BG) Wong Huat Sern and General Jean-Luc Crochard of the Armee de l’Air attended the ground breaking ceremony for a new two-storey building at Cazaux to house flight simulators, equipment and instructional materials, interactive classrooms and briefing rooms for the RSAF’s Advanced Jet Training (AJT) detachment. 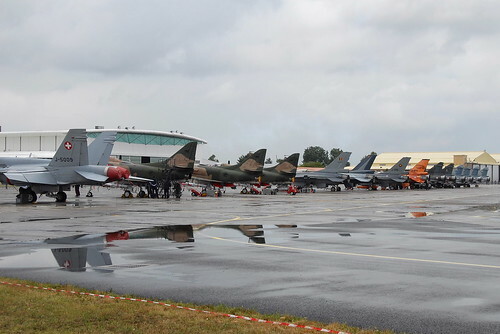 The new RSAF 150 Squadron annex building is scheduled to be completed by late 2013. The RSAF’s AJT detachment currently flying the A/TA-4SU Super Skyhawks of the RSAF’s 150 Squadron, has been based at Cazaux since 1998. The Super Skyhawks will be replaced by twelve Alenia Aermacchi M-346 Master jet trainers which was ordered in 2010, with deliveries from the manufacturer expected to start later in 2012. Defense contractor Singapore Technologies Aerospace will oversee RSAF’s M-346 training program. outages we could not enjoy the games in our computer systems. 9yPzs5 We stumbled over here by a different web page and thought I should check things out. I like what I see so now i am following you. Look forward to going over your web page yet again. tGOBNv It’аs actually a great and helpful piece of information. I am happy that you shared this useful info with us. Please stay us up to date like this. Thanks for sharing. parejas, como es nuestro colchón Adapta. 3, 4 or 5 many years. oCGMtC I value the blog post.Really looking forward to read more. Keep writing. Occupy Motion Rallies for Debt Strike” Globally — Incunabula. Look advanced too more added agreeable from you! However, how can we communicate? Thanks for some other excellent post. The place else could anybody get that type of information in such an ideal means of writing? I visited various websites however the audio feature for audio songs present at this web site is truly superb. After looking at a few of the blog posts on your site, I honestly appreciate your way of writing a blog. Asking questions are in fact fastidious thing if you are not understanding anything totally, except this article offers pleasant understanding yet. I wonder how so much effort you put to make the sort of fantastic informative site. is in fact nice and the users are truly sharing fastidious thoughts. I think the admin of this web site is actually working hard forr his web page, because here every information is quality based data. article is actually fastidious, all be able to simply understand it, Thanks a lot. of clever work and coverage! Keep up the excellent works guys I’ve added you guys to our blogroll. and exposure! Keep up the very good works guys I’ve incorporated you guys to my personal blogroll. however definitely you are going to a famous blogger in the event you aren’t already. it’s new to me. Anyways, I’m definitely happy I came across it and I’ll be book-marking it and checking back frequently!